“Look! It’s raining Story Starters.” Kids love this attention-getting language arts activity. In some parts of the world, March winds and April showers bring lovely May flowers. April showers…who says they have to be outside a classroom window? Creative teachers “make sunshine indoors” on cloudy or rainy days; they can also “shower students” with engaging in-class learning experiences, come rain or shine outdoors. Shower Kids with Story Starters – Kids love this attention-getting language arts activity. Bring an umbrella to class that you can easily open. Find or make a pattern for large raindrops, like you see in my blog pic here. Copy and cut out as many as will fit onto the exterior surface of the umbrella. Write Story Starters in dark marker, one on each raindrop. Story Starters may be working titles, like My Best Birthday Ever, or My Amazing Walk, that students can use to begin writing. “Imagine that…it’s raining Curious Cats and Dogs! Story Starters may also be sentence fragments, like The kids ran into a grassy clearing and all of a sudden…that lead into an unfolding tale. 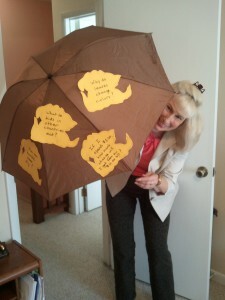 On the day that you plan to “shower kids with Story Starters,” open the umbrella and tape (use two-sided tape or tape loops) the raindrop cutouts to it ahead of class. Hide it until writing time. Lead into story writing by hoisting the umbrella above your head. For extra effect, slip on a raincoat. Announce that it’s time to “shower students” with Story Starters. At a later time, transfer the raindrops to a bulletin board centered with a cutout paper umbrella and a header, A Shower of Story Starters. It’s Raining Curious Cats and Dogs! – Prepare for this fun and challenging activity by following the basic steps to prepare for “showering students” with Story Starters. The cutouts I’ve used for “raining curious cats and dogs” are outlines of a dog and cat sitting side by side with identifiable ears and tails. Each cutout has a question written on it in easy-to-read dark marker. Connect questions to your curriculum. For example, science-based questions might include, How can Bumble Bees fly? Why do leaves change colors? A math-related question might challenge students to answer this: If I spend $3.00 (use your country’s currency), how much change will I get from a $10.00 bill? Curious cats and dogs may ask a Social Studies question such as, What do kids in other countries eat? 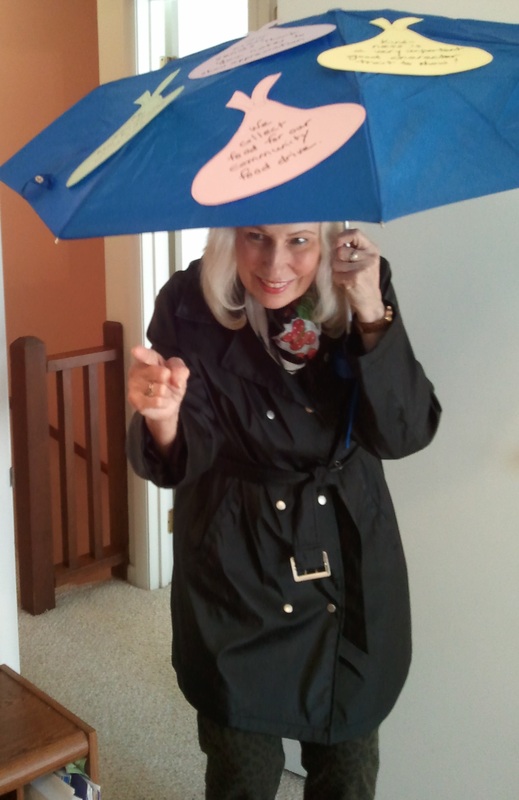 Explain that curiosity “sticks” (like the cats and dogs to your umbrella) to smart students. Curiosity is a skill that lasts a lifetime. How else can you “shower students” in school? Shower Kids with Kindness Kisses® or Other Candy – Character education is an ongoing initiative in many schools. Teachers benefit from access to new and creative ways to help students “buy in” to the importance of developing good character traits as they grow up. “Rain” in attention on the value of showing kindness by “showering kids” with Kindness Kisses® other candy. Bring out an umbrella again plus more tape and your dark marker. Get ready to make a lasting impression on your class about how sweet it is to be kind! For this activity, find or make large cutouts of candy, shaped like Hershey Kisses® or another candy that is popular in your culture. Present the candy-covered umbrella to your class. Hold it above your head or ask a volunteer to hold it above hers/his. Point to each piece of candy and ask volunteers to read aloud the examples of behaviors that show kindness. As time permits, elaborate on the behaviors. Ask students to recall a time when they acted as described on the candy. Shower Students with Follow-up Activities – Learning experiences that “shower students” with instruction that you have designed will make an even bigger impact when you follow-up with activities that are student-driven. 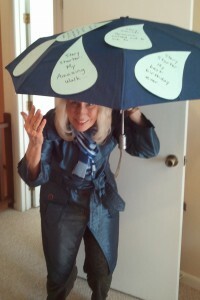 Write as Rain – Make extra copies of raindrop cutouts to distribute to students. Challenge kids to start their own story storms by writing Story Starters on the raindrops. Post the Story Starters for later writing time. My Curious Cat or Dog – Make extra copies of cat and dog cutouts to share with the class. Ask students to write questions about something that interests them on the animal cutouts. Make Kindness Candy Coupon Gifts – Make extra copies of candy cutouts for students to use. Suggest that students turn their candy cutouts into “coupons” that offer something that shows kindness to someone they know. Instruct kids to write their kindness offerings in the form of coupons on the candy-shaped paper. Plan for children to give their gifts at holiday time. that is…unless the showers are showers of experiences that entertain and educate students inside K – 5 classes. Please send comments about strategies you “shower on students” to promote writing, curiosity, and kindness. ‹ A Winning Theme: Grow a Love of Learning in a Garden of Learning! 3 Pings/Trackbacks for "Shower Students with Story Starters and More…"